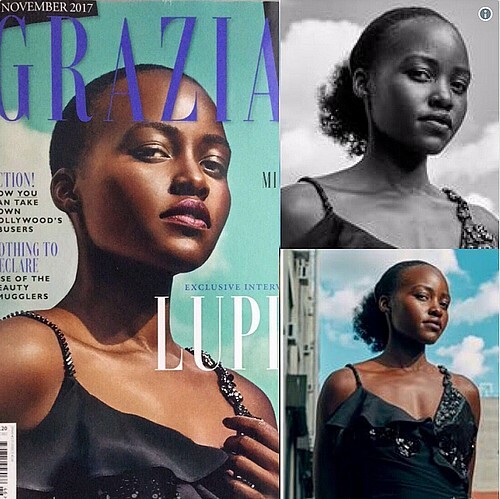 I see that the British edition of Grazia magazine has the opportunity to publish on the cover a close-up of the beautiful Mexican award-winning actress Lupita Nyong'o. I also see that the editors feel the need to retouch the photo, according to the required or self-imposed fees, as always it depends on the personal degree of imprisonment. At the same time, I see the brave actress openly rebelling against the wrongful manipulation, revealing it as yet another sling at the service of the Eurocentric popular picture. I see more, soon after, by widening the look and the usual, disorganized imagination, which I will never fail to apologize of. A room protected by aggressive guards and armed with threatening weapons. In the middle, an old man. A very aged one, with tired eyes, but still fixed on his own hand, that is, the claw clutching the consumed pencil which he passes with hellish repetition always on and on the same stretch of the governmental drawing. Lines and contours, full shapes and the empty ones, more than ever the paper that suits all is so worn out to implore pity and craving peace along with the past painted horrors, bravely burned in the bad times gone by. Nevertheless, the disturbing, yet reassuring canvas is still there, it resists with cruelty, despite the hourglass being losing the last grain of dullness. I see, I see it, like all of us, the mad design. The world we are experiencing, and at the same time unknowingly worship. On one hand an earth divided between rich and rich, and on the other a future pursued by the only humanity left. In the middle, the sovereign vignette, where white wedded white and black are confused with the latter, where everyone respects the destiny entrusted by the original geography and keeps the dress packed by the blind dressmaker with a very known name. At the end of the day, we are always with her. From the initial moments to the last song of this dishonest movie that now occupies every cinema on the planet. I’m talking about fear, that is, how it works. It’s a pair of glasses that take off dimensions instead of adding it. Fear is the most dangerous terrorist of this century. It forces us to live waiting for death from what is behind us, like the cave of the myth, sitting in good order to assist hypnotized at the performance of the aforementioned old guy. I see a child getting up among the crowd by the schizophrenic look.